If approved, the same filters will also be applied to the domains autofrage.net, computerfrage.net, finanzfrage.net, gesundheitsfrage.net, motorradfrage.net, produktfrage.net, reisefrage.net and sportlerfrage.net. Reopened due to serving of intrusive ads. We are currently in talks with them to resolve the issue and are otherwise forced to cancel the whitelisting. Ads inside questions have now been moved to the bottom. Yes, I would also say that ads on gutefrage.net are not acceptable. They seem like a normal user contribution, with a tiny little caption "Anzeige" exactly between the ad and the above user post. The only other difference is the image on the left, but it even has the same colours. IIRC this isn't the first time they changed the ads significantly after being accepted. EDIT: For now, I'll remove the acceptable ads checkbox. 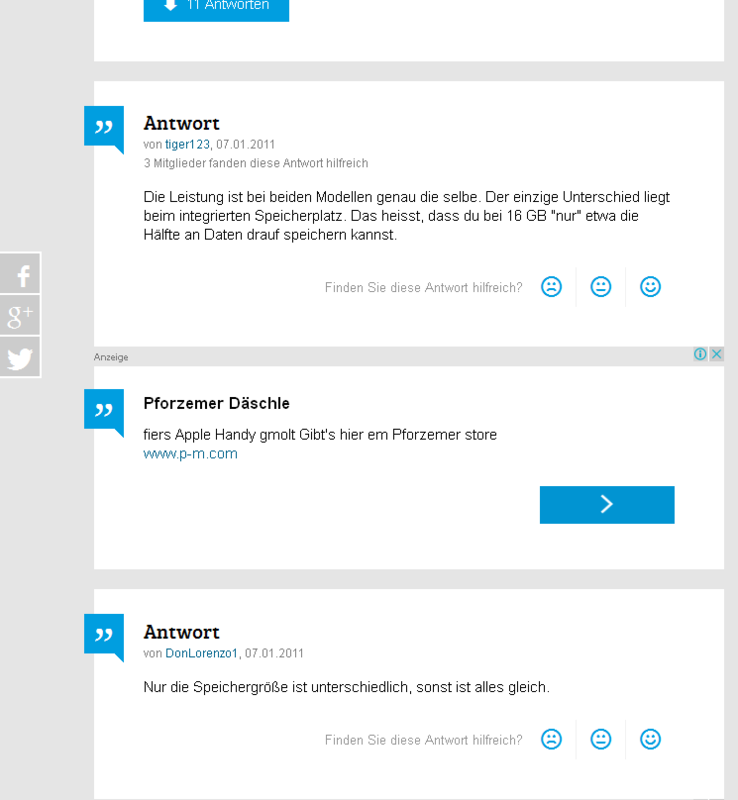 123 wrote: Yes, I would also say that ads on gutefrage.net are not acceptable. They seem like a normal user contribution, with a tiny little caption "Anzeige" exactly between the ad and the above user post. The only other difference is the image on the left, but it even has the same colours. Actually, these ads were put under review because the original proposal did not correspond to the ads they serve now. We detected those changes and contacted them to get the proposal updated. Also, some late changes on Google AfC ads resulted in the disappearance of the "advertising" label on some of them. We are currently solving this issue as well. As per the ad units you refer to, they actually do comply with the Acceptable Ads criteria, since they are labeled as such in two different ways: 1. Label on top left. 2. Exclamation symbol on the left to distinguish them from organic answers. They are also correctly separated from the content. We will take your concerns into account though and bring them up among the ABP team to see if there is room for improvement here. innerself wrote: 1. Label on top left. I still see a problem with this, as the label is 1. not clearly referencing to the box below, because it's vertically in the visual middle of the user post above and the ad below, 2. in comparison to the ad barely visible (remarkably smaller font size, and similar font and background colour). innerself wrote: 2. Exclamation symbol on the left to distinguish them from organic answers. I still see a problem with this, as the symbol is the only difference: the colour of the symbol, the background colour, the shape the symbols are on, the font of the content of the boxes are the same. Therefore, it's very hard to distinguish the ads at first sight. innerself wrote: They are also correctly separated from the content. They may be separated, but they still look much too similar to organic answers. In my opinion, unobtrusive ads shouldn't look all too much like organic answers, and should be distinguishable at first sight, not after having to check for minor differences. 123 wrote: I still see a problem with this, as the label is 1. not clearly referencing to the box below, because it's vertically in the visual middle of the user post above and the ad below, 2. in comparison to the ad barely visible (remarkably smaller font size, and similar font and background colour). According to the natural reading flow, top left is the first spot to be read. Still, a bigger label would be ideal. 123 wrote: I still see a problem with this, as the symbol is the only difference: the colour of the symbol, the background colour, the shape the symbols are on, the font of the content of the boxes are the same. Therefore, it's very hard to distinguish the ads at first sight. There are more differences. The word "Antwort" is missing on the ads and substituted by the ad headline. Feedback icons are missing, and an extra button with an arrow -common on Google's AfC ads- is showing. Thanks for the heads up! Unfortunately, I could not reproduce the issue. Will continue trying it. Also, as I pointed out, your concerns will be raised among the ABP team. Solved. The label shows again. After valid concerns raised, Gutefrage.net Google AdSense text ad units between questions are now under review due to insufficient labeling. A batter label and more clear separation from the content will be asked. Changes should be deployed within the next 30 days. innerself wrote: After valid concerns raised, Gutefrage.net Google AdSense text ad units between questions are now under review due to insufficient labeling. A batter label and more clear separation from the content will be asked. Changes should be deployed within the next 30 days.